Subject headings describe the overall subject of the article. An article can have 1 subject heading or it can have multiple subject headings. If you find an article that you like, click on the title, and in most databases you should see the subject headings assigned to the article along with other information. Subject headings are chosen from an assigned list by the database, that way multiple articles on the same topic should have the same subject heading (or similar multiple subject headings) which then creates consistency throughout the database. 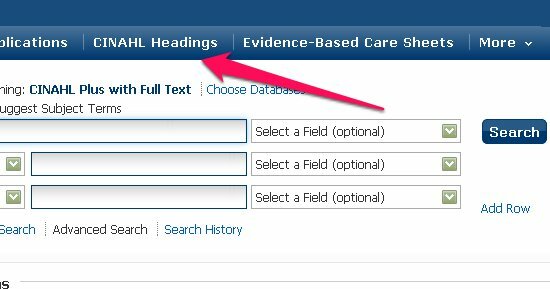 For example, if you went in to the CINAHL Headings and typed in the search box HIV it would return all the headings related to HIV and it might also tell you to use a different word in place of the one you typed in. Subject headings are a way to learn the language of the database and a way to discover other, and maybe, more exact words than what you started with.